Obesity has become a national epidemic and the only proven long-term method of weight loss is surgery. The laparoscopic Roux-en-Y gastric bypass is the most common bariatric procedure performed in the United States. Achalasia, a swallowing disorder of the lower esophageal sphincter (LES), is uncommonly found in obese patients or formerly obese patients. 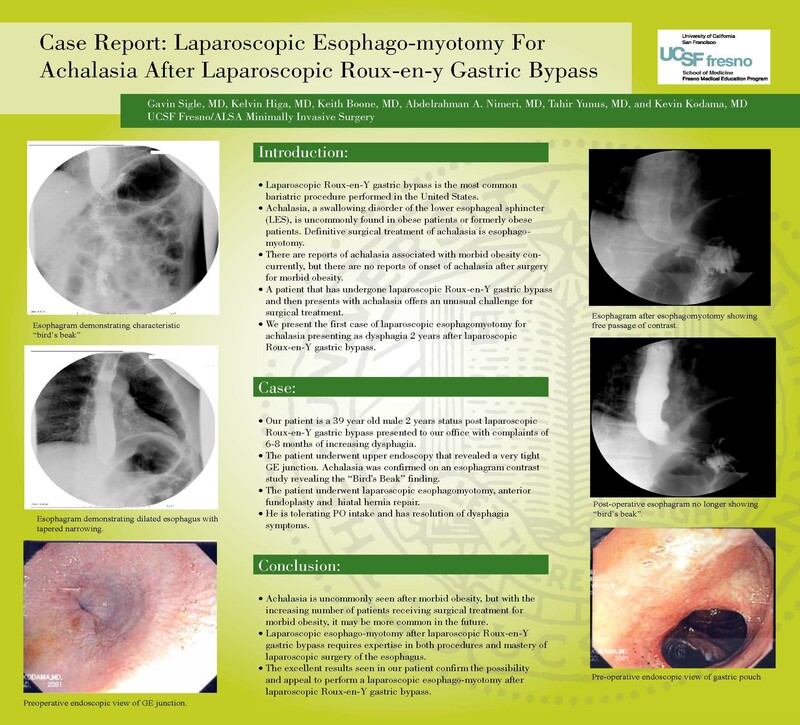 Definitive surgical treatment of achalasia is esophogomyotomy. The patient that has undergone laparoscopic Roux-en-Y gastric bypass and then presents with achalasia offers an unusual challenge for surgical treatment. We present the first case of laparoscopic esophagomyotomy after laparoscopic Roux-en-Y gastric bypass.